Know someone really smart but...challenged in people skills? 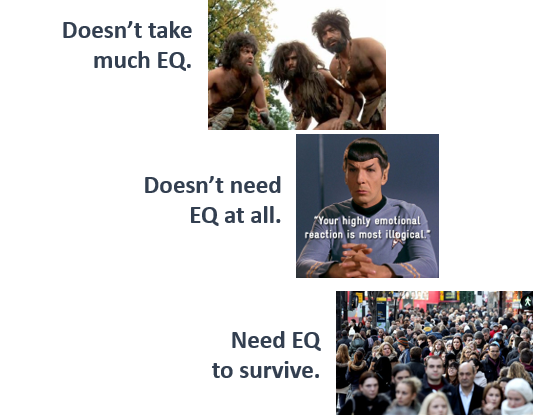 IQ and EQ are not the same thing! Special guest: David Freedman of PEAR Core Solutions, Inc.
Raise your hand if you have ever known someone that was really smart but….“challenged” in the interpersonal skills department. Perhaps you once had a boss – or you have one now – that got into their role based on their deep knowledge of the job or their past successes at the company, but who then struggled with effectively leading others? Ask this person a question about technical aspects of the job, and you know that you will get accurate information. But, good luck approaching them with that question, because there never is a “good” time to do so. They’re either too busy, too annoyed, or too quick to respond negatively to your question. Do you know someone like this? Are YOU someone like this? The likely answer to both of these questions is “yes” (even if you are not willing to admit it). We all struggle with responding to the day to day stresses of life and work, and we frequently find ourselves responding too quickly, getting angry too easily, or blaming others for our own shortcomings. To “nutshell” it for you, emotional intelligence is the ability to manage ourselves and our relationships. You may read that and think, “I manage myself all the time and I have friends, so I’m good.” Perhaps you’re right. I assume you probably didn’t do anything to cause physical harm to someone else today. Maybe you kissed a significant other today, and maybe you even made plans to get together with a friend. Looking deeper into emotional intelligence, however, reveals that it requires us to be SELF-AWARE at all times and SELF-REGULATING under all conditions. Why? Because doing so builds our ability to make better decisions “in the moment,” bounce back from stress, and ultimately deal more effectively with other people. Are you aware of – I mean truly understand – the emotions you feel on a day to day, hour by hour, minute by minute basis? When your phone buzzes with a new text, does your heart race (either from excitement or stress)? Your reaction – positive or negative - is an emotional response. This type of thing happens to you every waking moment of every day. How often are you aware of those emotional responses? Try it for 1 hour. Decide that you will pay attention to your feelings and emotions for 60 minutes. Assuming you get distracted and forget for most of that hour, you will still likely realize that your emotional status changed quite a lot during that time. Yesterday, I was standing in line at my nearest coffee bar, when a woman walked in, looked at the (relatively short) line, sighed audibly, proclaimed “this is ridiculous,” and walked out. Who lost on that reaction? The coffee bar is doing just fine, but she allowed her emotions to trigger an over-heated response to a low-stress situation (oh, and she never got her cup of coffee). Do you ever over-respond to situations? Have you ever yelled to another driver because of a move you didn’t like? Have you ever said something rude to a waiter because the food (through no fault of that waiter) took longer than you liked? By the way, in either of these circumstances, did you feel better for having done so? WHY SHOULD I CARE ABOUT EMOTIONAL INTELLIGENCE? You can get by in life without paying attention to this stuff. The unwritten rules of society and workplaces are constantly getting more and more complex, however, and the stresses of everyday modern life can become intense. We all need to ensure that we are equipped to meet those challenges or we risk getting left behind.